Entering the final stretch, today I sat down and wrote a comprehensive list of things I need to tackle before I am ready to hand, and then started tackling top priorities. Everything is coming together pretty nicely, except my eyes. They are feeling pretty square and computery. Today I made a water shader and a tadpole particle effect. The water shader is basically just reflections distorted by a normal. 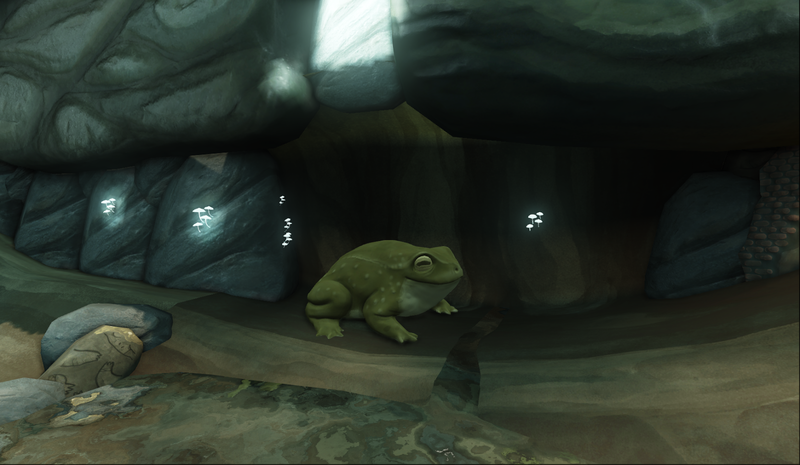 The tadpoles is an animated particle effect (meaning the texture has all the frames and the uv-space flicks from one part of the texture to the other very fast, like a flipbook animation), so it looks like the tadpoles wiggle along. You can't see it in the screenshot and indeed it's so hard to see in game I sorta wonder why I did it, and I'm thinking about cranking down the water distortion a fair bit for that reason. I hadn't done any particle stuff before but it was pretty simple to figure out.